You've probably seen the row of carefully coiffed Japanese princesses attending events at the imperial court: immaculately dressed royal ladies sporting coordinated sets of jewels and toting traditional fans. One of the most senior of these women is the Princess Akishino, the wife of the second son of Emperor Akihito and Empress Michiko. 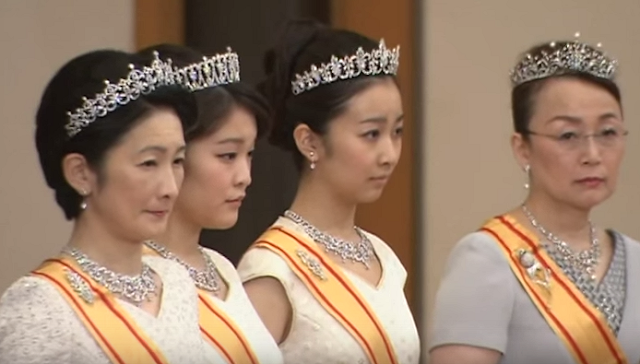 Let's have a look at the tiara that Kiko wears, shall we? 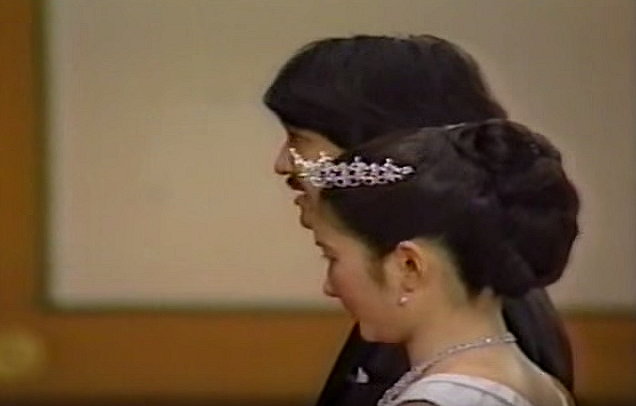 We don’t know much of anything about the provenance of this tiara (the Japanese Imperial Household Agency is notoriously tight-lipped about details of the imperial family’s lives and possessions), but it made its first appearance in 1990 at Kiko’s wedding to Prince Fumihito, the second son of the emperor. Like all other tiaras owned by the Japanese royals, Princess Kiko’s tiara is made of "white" jewels — you’ll only find diamonds and the occasional pearl in these sparklers. White is considered a sacred color in Japanese culture, so it makes sense that they’d want their jewels to be equally blessed. All of the aspects of the imperial family's appearance are tightly controlled by the Imperial Household Agency, hence the uniformity of their clothing and jewels. 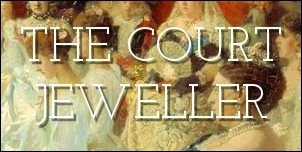 Most of the tiaras given to Japanese princesses are a part of a parure, which generally also includes a mirrored necklace and sometimes a coordinating brooch. Kiko nearly always wears her tiara with the matching necklace; she also wears the simple earrings worn by virtually every other female member of the imperial family at gala events. Even though Kiko is the wife of the emperor's younger son, she appears in a prominent position at court occasions (in part because Crown Princess Masako, who has suffered with health problems for years, is frequently absent). At the annual New Year's Court, at state banquets, and at any other event requiring a tiara, you'll see Kiko wearing this one.